The following is an excerpt from a memoir I’ve been writing. Hope you enjoy. It was January 28, 1986. I was a twelve-year-old pimple-faced boy who thought he had life all figured out. And why wouldn’t I think that? I spent the first twelve years of my life learning how I was one of God’s chosen people. I was given a narrative to live by and a story I could know was true. Growing up in my large family in a small Christian school bubble, I had no reason to doubt any of the stories given to me. I was taught many different aspects of our one true God. He was our creator, our provider, he was jealous, and he lavished his love on us. He wanted nothing more than to see us happy, healthy, and worshiping him with our gifts and our talents. I always considered myself lucky to be born into a family similar to the royalty found in the Bible. I related to characters like Joseph, King David, and Moses. Being one of God’s chosen is rough stuff; there’s always somebody trying to knock off your crown or steal your colorful coat. I learned that as long as I was a good boy and didn’t let the devil trick me into sinning then the Lord would bless me more than I could imagine. So I took this very seriously. If I did my part, then God promised to do his part since he controlled everything in the universe. He was all-powerful, all-knowing, and all-loving. How long does it take for doubt to sneak into a young boy’s mind? The months leading up to January 28, 1986 were full of excitement and intrigue. The entire nation united behind the first civilian to ever join NASA into space. Christa McAuliffe was ballyhooed as “Teacher in Space” and everyone in my Christian school bubble was enthralled. We prayed for Christa and her crew on a daily basis leading up to the launch. We prayed for safe travels for Christa much the same as we prayed for Sandy’s parents who were driving to Florida over Christmas break. I learned early on that having God’s protective hand with you was the safest way to travel. Everyone I prayed for always made it to and from their destination when I summoned God’s protection. 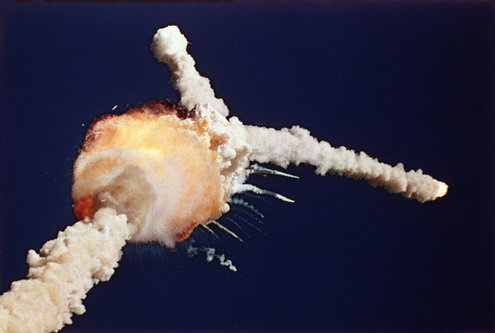 So with my small Christian school bubble (along with the entire nation), I watched the crew and “Teacher in Space” wave their goodbyes and enter the Space Shuttle Challenger. The news reporters filled the much-anticipated telecast full of interviews with family members of the crew and NASA experts who described what Christa was probably thinking and feeling as she made her way to her front row seat to outer space. As the moment of liftoff grew closer, I rocketed up one last silent prayer for the crew’s safety. I asked God to go before them into space and alleviate any troubles they might encounter on their mission. But most importantly, I asked that their reentry into the earth’s atmosphere would be successful (I heard somewhere the reentry is always the scariest part). There she went, the first civilian ever in space. While the shuttle continued to climb through the sunny-blue Florida sky, I sent up a thank-you-Lord for their successful launch. 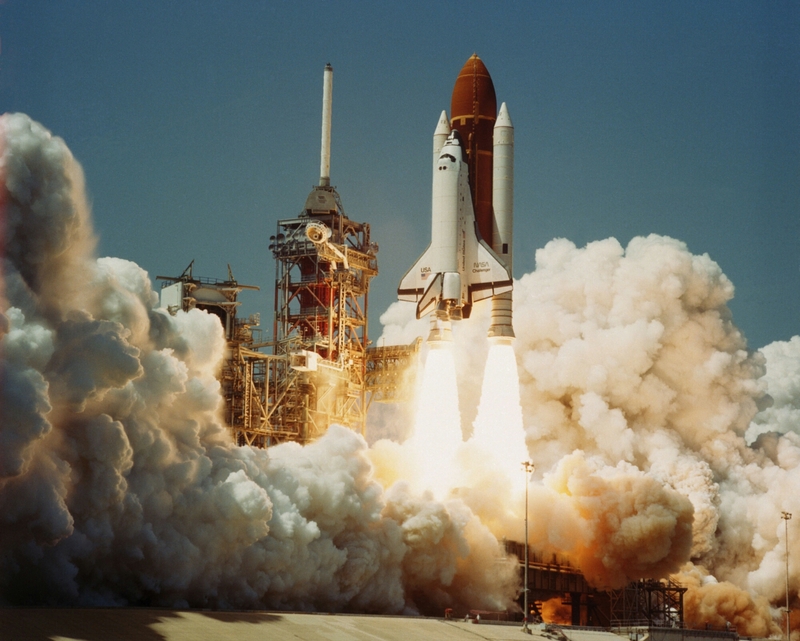 Seventy-three seconds into their launch, the Challenger exploded. Disbelief, shock, panic, and trauma swept through the crowd and the world. 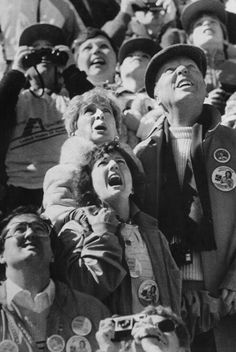 Family members and loved ones who stood on platforms to watch the event live looked at one another then back in the air, with one hand blocking the sun from their eyes. Christa’s parents, who seconds earlier were full of pride, now appeared to be lost and confused. They looked around for an explanation, looked at each other, then looked back in the air. Their daughter, who was celebrated for months as “Teacher in Space” and beloved by the entire nation, didn’t make it into space. People around them screamed. Wives started bawling. The news reporters were astounded. “RSO reports vehicle exploded,” was heard from the live feed from NASA. I looked at my teachers and fellow students in disbelief. School was let out early that day and I went to my friend’s house. We were glued to the TV as the news dissected everything from that morning. We watched replay after replay of the explosion and listened intently to all the experts who took stabs at what could have gone wrong. Even our beloved president’s words confused me. I prayed for God’s protection. It made no sense. I couldn’t wrap my mind around the jokes my older siblings were already making about the new brand of fish food called “Teacher in Space.” I laughed off their jokes on the outside but on the inside I was reeling. I was one of God’s chosen people. I was a good boy. I prayed for safe travels—and for a safe reentry. None of it made any sense. Seventy-three seconds, and then. . . .
That explosion cracked a hole in my shield of faith where doubt could trickle in. The months and years that followed, I was forced to grapple with the idea that life—and God—might not be everything I was taught to believe. No matter how hard I prayed; friends still died, loved ones still got cancer, children were still abused, and safe travels weren’t always safe. I was a twelve-year-old pimple-faced boy who thought he had life all figured out. I may or may not post more excerpts in the near future. Next Counseling, Here I Come! Why did you say “I may or may not” post more excerpts in the near future ??? Excellent post, Travis. It brings to mind the ongoing debate between determinists and libertarians. Is our life story determined by forces beyond our conscious control or do we have free will? You should post more excerpts….. Thanks a lot Bill!! Yes, the ongoing debate is one I wrestle with time and again. Maybe they’re both right??? By the way, I miss our bi-weekly talks. Hope you’re doing great!! I came to your site for the Tolle quote about watching your next thought “like a cat”. (I find it very useful and enjoy sharing it with friends). Your account of the day of the “Challenger” tragedy moved me my friend. I remember that day well. I was a bit older than you, chronologically anyway. I had therefore already had a few holes punched into the break-wall of my faith I stopped working at my maintenance job in a little condo I had an account with in Kapalua, a place in Hawaii that I worked, to watch the launch on my clients TV. I was excited that we (Humans) were sending ourselves into space. It seemed a good next step for us, at the time. I watched, a bit blurry eyed as I remember from the night before, as the space shuttle shot up into the atmosphere, a raging plume of fire piercing the deep blue sky. And then, unexpectedly, unbelievably, exploding in all directions across that deep blue sky. My immediate reaction was disbelief. And then great sorrow. Not just because of the tragic loss of life, but also the great loss of the dream. The dream of space travel and exploration that I knew, even at the time, had been dealt, at the very least, a near-death blow. Your relating of this incident has evoked a deep memory for me. It feels very related to the collective and individual journey into the unknown that we’re all embarked upon, whether we like it, or even know it. It’s potential price as well as it’s reward. Thank You for sharing. And, by the way … keep writing. Thank you, Allen (if my detective skills serve me correctly). I really appreciate your feedback and I’m thankful my writing evoked some memories of your own. It’s funny, isn’t it, how we all have very personal stories near and dear to our hearts. And yet, we all share this collective story. My goal in writing this memoir is to share how my personal story has shaped me, and how our collective story continues to astonish me every day. Thanks again for your kind words!